I admit, the portion I ate was twice this size! Baby already knows her mother well. One of the only daytime tv shows I consider worth watching on the few channels we receive is In the Kitchen with Stefano Faita. I only recently discovered it, because it happens to coincide with one of Baby’s feedings. Now I watch it as long as Baby’s feeding schedule allows. The other day Stefano did a show about using leftover bread. 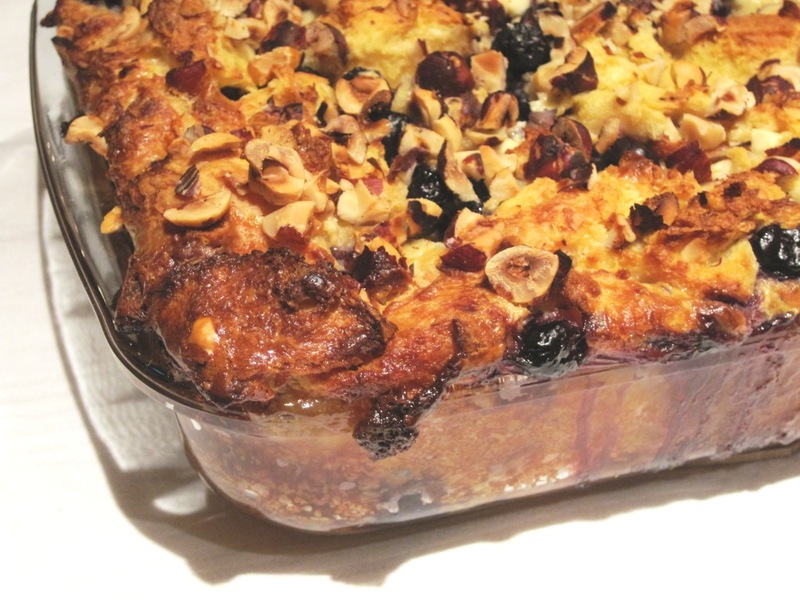 The last recipe of the episode was a bread pudding. He brought back memories of my childhood. 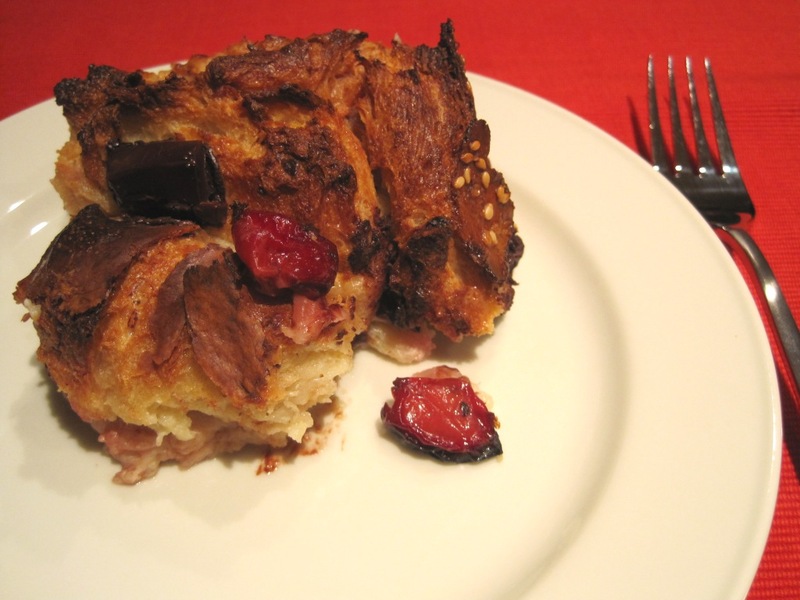 When I was little, we had bread pudding for dinner every once in a while. My mom would diligently let dry every scrap piece of bread and collect them in an old ice cream container. When the container was full, it was time for bread pudding. 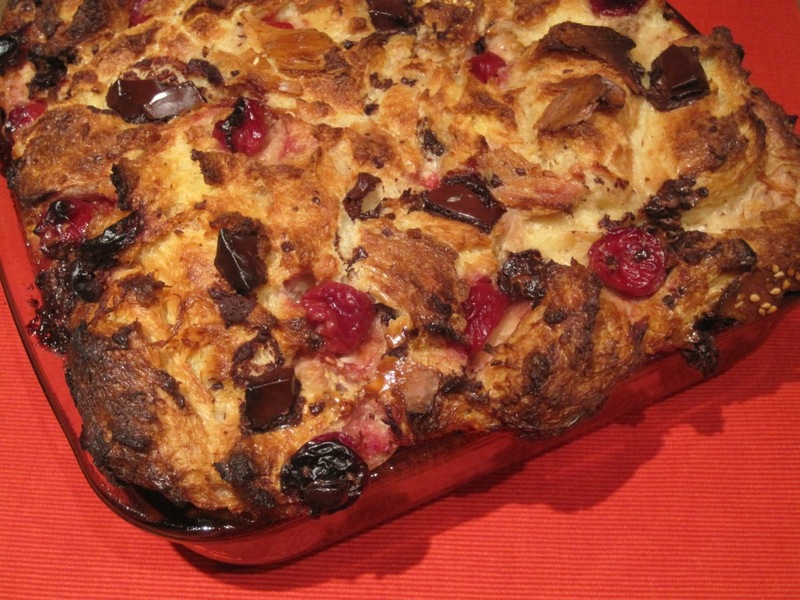 She’d soak the bread in a milk and egg mixture, then mix in some sliced apples and raisins. Only lightly sweetened, she’d serve it with homemade vanilla sauce. Makes one 9″ x 9″ dish. Tastes great – almost better – the next day! Preheat oven to 350°F. Butter a 9″ x 9″ square baking dish. Tear bread into pieces and place in a large bowl. Add sour cherry mixture and chocolate. Toss lightly to combine. In a separate bowl, beat eggs with sugar until combined. Whisk in milk and cream. Pour egg custard mixture over bread and stir to evenly combine. Let stand for 15 minutes so that bread absorbs the egg mixture. Pour bread and custard mixture to the buttered dish; it will fill the dish to the top. Bake until custard is set, and top of bread pudding springs back lightly when touched, approx. 45 minutes. Tear bread into pieces and place in a large bowl. Add blueberries, white chocolate and three-quarters of the hazelnuts (keep the rest to sprinkle on top). Toss lightly to combine. Pour bread and custard mixture to the buttered dish; it will fill the dish to the top. Sprinkle reserved hazelnuts on top. 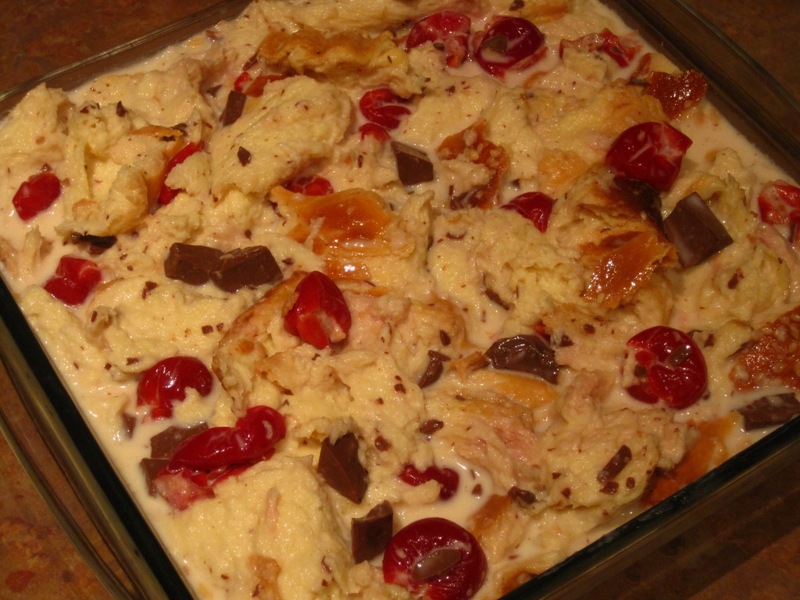 Bake until custard is set, and top of bread pudding springs back lightly when touched, approx. 45 minutes.